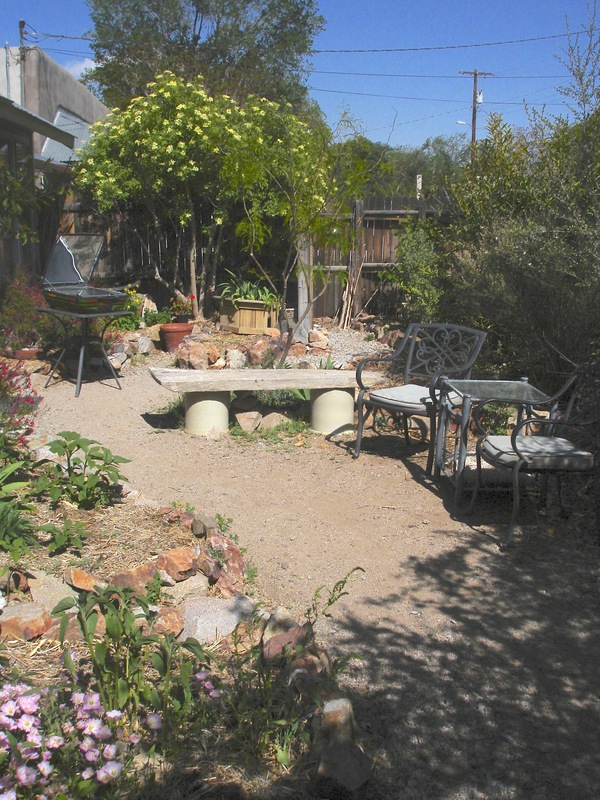 This garden was honored to be in Silver City’s Evergreen Garden Club “2013 Annual Garden Tour.” Many said it was their favorite garden that day. More on the home and garden design page. 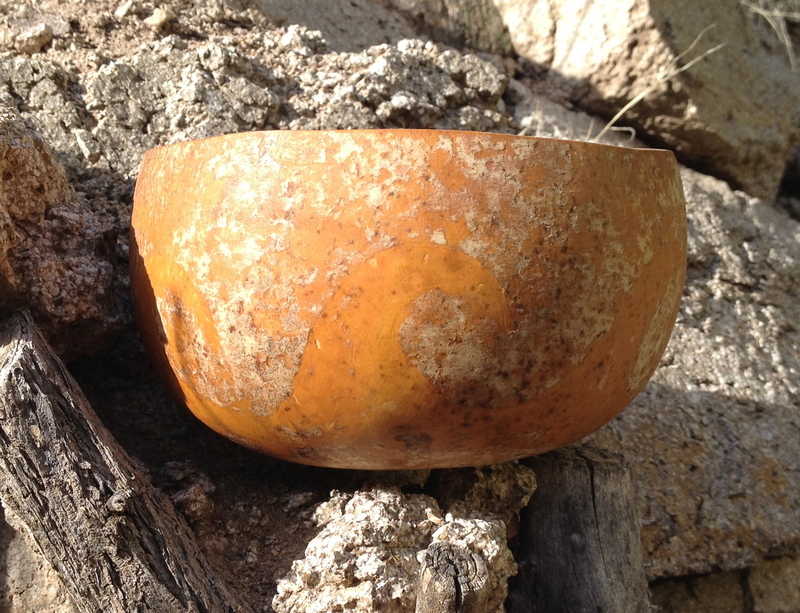 This outdoor lime plaster carving I created in 2006 at the Canelo Project in southern Arizona. 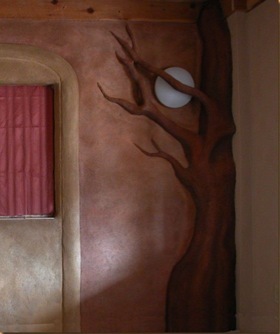 The tree sculpture in the center of this adobe wall was conceived by me, then constructed and co-designed by my plaster artist friend, Gavio, with branches I found, selected, finished, and for which I chose their precise locations. Gavio constructed the tree, built-in adobe-and-wood shelves, and the relief work around the sconces. We shared the adobe application and finish work. The adjoining walls are finished with home-made clay paint. 2009. My office wall was designed by Gavio, with my major contribution being the full moon light behind the tree branch. More on the stone and plaster page. 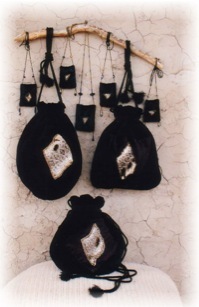 These dressy, natural-fiber handbags and medicine bags were crafted of recycled natural-fiber velvets and velours, roadkill rattlesnake skin (cured with vegetable glycerine), gold glass beads, and cotton, rayon, and silk thread and cord. 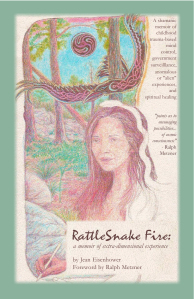 The series was juried into two art shows, one in Tucson in 2004 and another by the Mimbres Regional Art Council in 2007, where my work was among the few purchases. More on fiber art page. Art awards include a National Merit Award for a pencil portrait (lost). 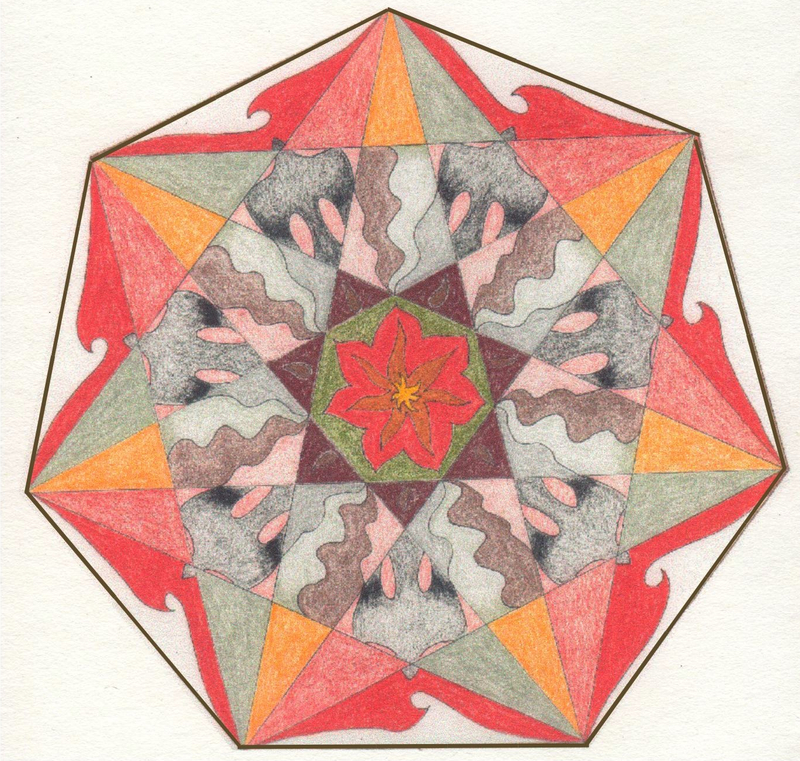 Colored pencil, 7-sided mandala of waveforms. 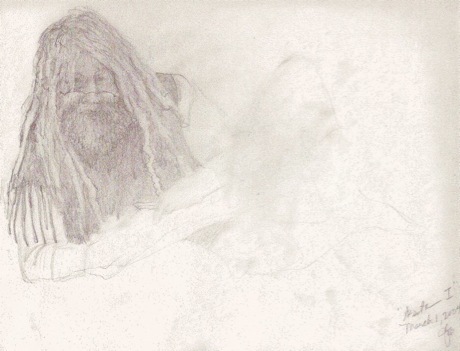 Pencil sketch of artist Asante Riverwind. 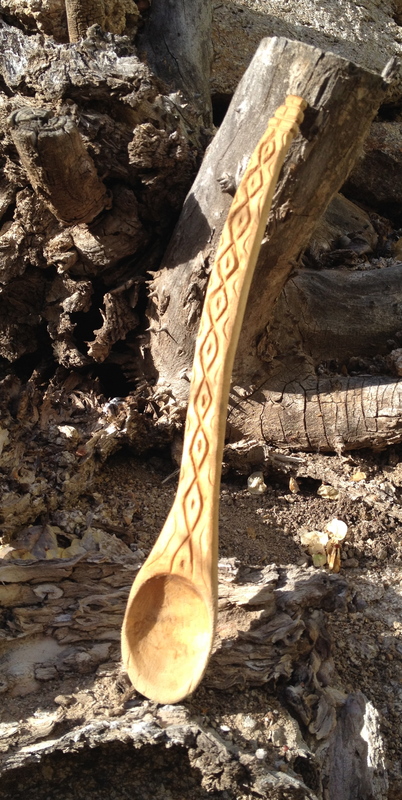 Carved spoon, diamond-back motif, 2006. Cured “roadkill” rattlesnake skin on purses, hanging on my “hand-drill” (fire-making) bow. Jean, your bird nest bag made of felt is lovely and an inspiration to me. I have wanted to create felt but I haven’t yet and may never get to do it, but I do create other precious pieces. Also, I enjoyed seeing your adobe wall and tree. You remind me of myself as you are a creative soul, and it is a pleasure to witness what you do with your gifts. Thank you, Illuminata! I hope your art and other work are going well.